Glenn was in Frisco for a Westin Stonebriar wedding on Saturday. John’s family is from Chicago and Jessica’s family is from Long Island, so nearly everyone of the 200+ guests in attendance traveled to celebrate with them. John and Jessica met at Clemson University where Jessica was a member of the Rally Cats dance team, and is now a member of the Dallas Cowboys Rhythm and Blues dance team, so needless to say there were a lot of dancers! What happens when you mix college and professional dancers, crazy Clemson alums, and out of town family? An INSANE party from start until finish. Check back soon for the highlight video from ProEdit Productions. Here is a panoramic of the room. Apologies that the iPhone doesn’t consistently capture the shade of the lighting. 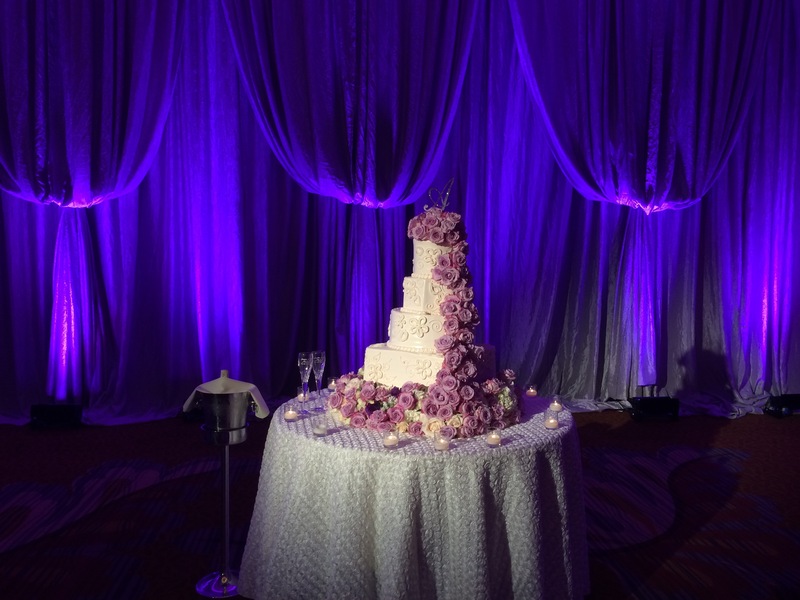 The lighting in the room actually looked like the shade of purple in the cake photo underneath. The cake by Frosted Art Bakery turned out so beautiful.